A Zen Cart™ discounting module allowing vendors to create "buy one, get one" style discounts. Example Discounts: I have provided several examples of Zen Cart Better Together discounts. See interoperability for changes required for Edit Orders and Better Together Admin. Be sure to see the rest of the Better Together World. Configuration: The basic configuration of Better Together involves adding PHP code to the setup() function in the module, as shown below. For people who would prefer not to do this, a Better Together Admin panel is available. Many examples of basic configuration are shown in this help file; examples of advanced configuration are also available. See it Live: Go to product 7 in my demo shop (You've Got Mail), and you will see the upsell message for product 19 (Something about Mary). The converse is also true. Better Together is an order total module, so the discount is not visible until the second page of checkout. 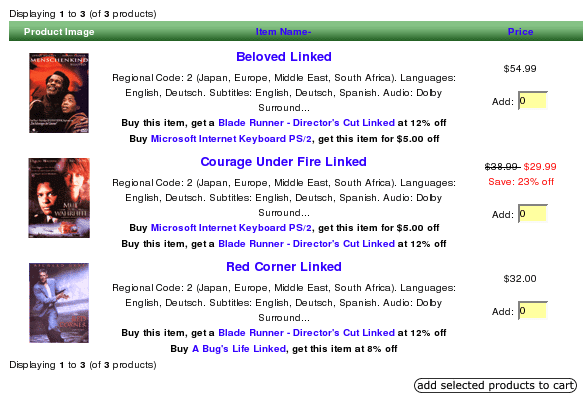 If you want to see the discount on the shopping cart page (or sidebox), look at Discount Preview. The Checkbox Cross Sell allows you to enable add to cart of items which are cross sold through better together with just the tick of a checkbox. The items appear on the product info page underneath the add to cart button, and if checked, are added at the same time as the main item. The Better Together Admin panel (a separate product which is sold as commercial software) allows you to create discounts without needing to edit files. Better Together Admin also offers the ability to automatically start and end Better Together offers on specific dates. If you add product 12 to your cart in my demo site, you will notice that on the shopping cart page (and the first checkout page) that Checkout Candy re-enforces the upselling message. You can see Better Together with Buy Both Now by looking at product 3 in my demo shop. If you add both these products to your cart, you will be able to see the discount in your cart because of Discount Preview. The Better Together Promotional Page allows you to display all your Better Together discounts on one page. Here is a sample of the Better Together Discount promotional page. You can even do a single-click add for two product discounts with no attributes on the Promotional Page using Add Both to Cart. The Better Together Centerbox allows you to display your Better Together offers on your home page (and optionally other pages). osCommerce User? This is a Zen Cart page. Look at the Better Together for osCommerce World for osCommerce help. The gold standard of online retailing is Amazon.com. Zen Cart store operators looking to increase their profitability should constantly be asking, "WWAD?" or "What would Amazon do?" When you look at an item in Amazon, not only is a cross selling recommendation made, a discount is offered to persuade the customer to accept the recommendation. This mod permits you to offer this type of discounted cross selling in your Zen Cart. You may also specify cross sells for any of these variants ("You may also be interested in ..."). Cross sells are pairings like the ones listed above, but without a discount. Better Together is an order total module, so it appears on the second page of your checkout as a discount (unless Discount Preview is used, which allows the discount to be shown in the cart). This still works, but now another available option is the Better Together Admin panel (a separate module which is sold commercially). Better Together Admin is easy to use and fast - and it's a great way to show your support for Better Together. Here's a video showing how Better Together Admin works. If you wish to continue editing the setup function, here are some examples. The link is created to facilitate the cross sell. This step is optional; if you prefer, you can add your own cross selling text. Where 27 is the HP LaserJet Printer, 3 is the Mouse, and 25 is the keyboard. Now suppose you have 1 product 27, and 2 product 3 and 2 product 5 in your cart. The way Better Together has always worked is as follows: it would run the first rule, see that item 27 was in the cart, see that item 3 was in the cart, and discount item 3. Now item 27 would no longer be permitted for use in discounts, and that would be the end of the discount. This is shown, using Discount Preview, by the following screenshot. Note that the discount is $20.00, 50% of the the price of the mouse (item 3). 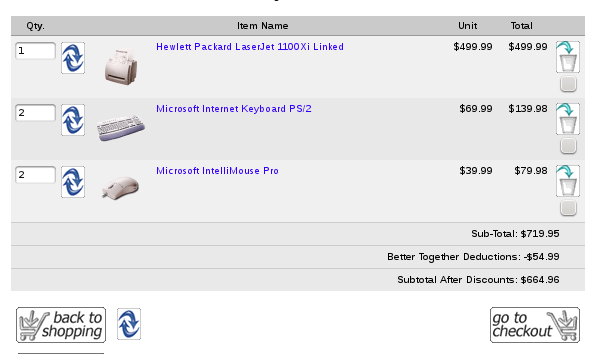 Some people wanted the option of discounting both item the mouse and keyboard, even though there was only one printer in the cart. In Better Together 2.5, this can be done by setting the configuration option One to Many to 1 (in Admin->Modules->Order Total->Better Together). 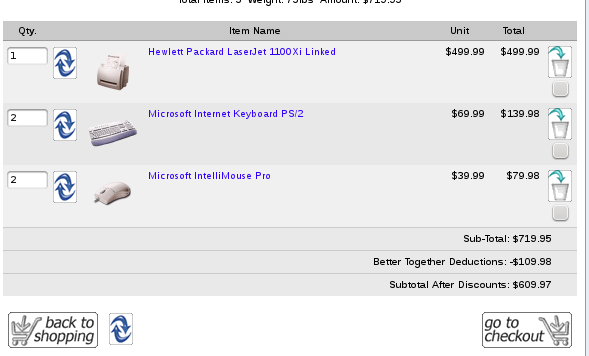 Note that the discount is now $54.99, which is half the price of the mouse (item 3) and the keyboard (item 27) combined. And finally, some people wanted unlimited mice and keyboards to be discounted, which can be done by setting One to Many to 2 (in Admin->Modules->Order Total->Better Together). Note that the discount is now $109.98, which is half off the price of two each of the mouse and the keyboard. Note: If you were running Better Together 2.4 or older and you download version 2.5 or higher, you must go to Admin->Modules->Order Total and Remove and Re-Install Better Together to get access to this feature. will actually wind up giving 60% off the second item 27. If you need both one to many discounts *and* BOGO style discounts, consider doing your BOGO discounts using Free Gift Chooser. Note that the "category" in add_cat_to_cat(), add_prod_to_cat(), add_cat_to_prod() and add_twoforone_cat() is the parent category, as determined by the master_categories_id field in the products table. If subcategories are being used, the parent category will not be the same as the top level category. If the product is linked to another category, the parent category will still be the original parent category (the master_categories_id field). In this example, the parent category of "shirt A" is "Shirts," not "Men's Clothing." "Men's Clothing" would be considered the top level category. In stores where the first level of categories has products directly underneath it, the top level category and the parent category are the same. If your store uses subcategories and you require the ability to reference categories at different levels, you may wish to consider purchasing Discount Chooser. Again, note that "parent category id" is determined using the master_categories_id field from the products table. So if Shirt A is also linked into a category called "Hot Products," the parent category is still category 12 (Shirts). For more details on category handling in Better Together, please see the Category Issues page. If you already have the Better Together module installed, please uninstall your old copy by going to Admin->Modules->Order Total, selecting "Better Together" and pressing the "Remove" button. Make a note of your settings so you can apply them to the new version. Decide on the linkages you wish to use, and add them to the setup() function in includes/modules/order_total/ot_better_together.php Open a shopping cart in another window to test these discounts. They are shown on the second step of checkout in "Your Total" under "Better Together." If you wish, follow the guidelines in marketing. For Better Together Admin panel users: Forgetting to modify includes/modules/order_total/ot_better_together.php as described in the Better Together Admin Panel instructions. Using a category function - add_prod_to_cat(), add_cat_to_prod(), add_cat_to_cat() or add_twoforone_cat() - can cause problems - see the Category Issues page. The final curly brace must not be deleted. Showing the Better Together discounts as text/image links using tpl_better_together_marketing.php, as described below. Showing the Better Together cross sells as text/image links using tpl_better_together_xsells.php, as described below. As checkboxes on the product info page, allowing people to add cross sell items without attributes to their cart when they add the main item, using Checkbox Cross Sell. As links on the product info page, including a single button which will purchase both items, with Buy Both Now. "Buy this item, get name-of-product-12 free"
"Buy this item, get name-of-product-17 free"
"Buy name-of-product-8, get this item free"
Probably a bit more obnoxious than you would truly want, but you get the idea. Buy Both Now is sold separately from Better Together; it's a paid add-on. There are also marketing opportunities on the Shopping Cart page; the Checkout Candy module can be configured to show available Better Together discounts both on the Shopping Cart page and on the first page of checkout. The cross sells work differently - since there is no discount to be displayed, they are shown more like a regular Zen Cart product display. The other available marketing vehicle is the Better Together Discount promotional page. This page is completely optional; it is not included in the Better Together Contribution, but it is a free download. It creates a page that looks like this, displaying all discounts. You may also optionally add an "Add Both to Cart" button to the Promotional page; see the Better Together Promotional Page for details. Discount Preview makes Better Together pop! It shows the discount on the shopping cart page, instead of making your customers wait until the checkout payment page to see their discounts. 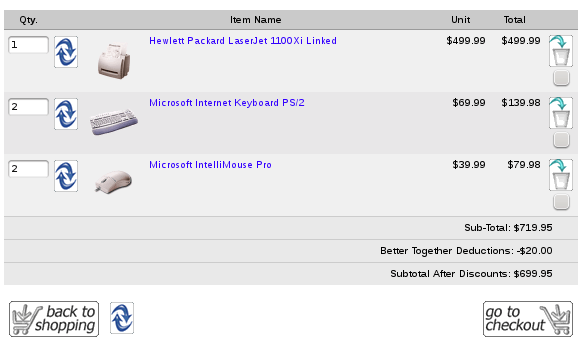 Here's a screenshot of the shopping cart page on a cart using Discount Preview and Better Together. The discount was a prod to prod linkage between these two items. Notice that the description has been changed to "Bundle discount." Discount Preview is sold separately. Buy Discount Preview Now! 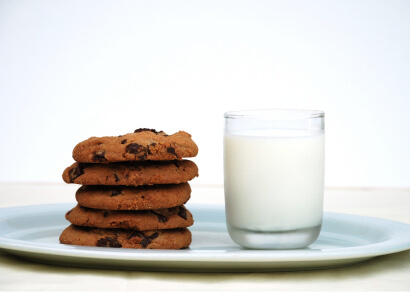 2.5.1 03/01/2014 Interoperability issue with Checkout Candy and Better Together > 2.5. 2.5 06/01/2013 One to Many feature. 2.4 04/16/2013 Code inspection and cleanup. No functional changes. 1.6 12/14/2007 Compatibility with 1.3.8. 1.5a 09/18/2007 Fixed Google Checkout issue. 1.4a 07/31/2007 Simplified inclusion of marketing logic by adding it to this package. Some minor language improvements. 1.3 12/30/2006 Adding marketing ability to print discounts in reverse order. (If buy A, get B free is offered, can now show this on B's page, not just A's page.) Allow products which are ordered in odd quantities to be used as twoforone *and* better together discounts if so specified. Previously, twoforone products were not additionally checked for better together discounts. Users wishing to sort native discounts (such as Coupons or Group Discounts) after my discounts, with tax recalculation, should look at this page. Older versions of Better Together (prior to 1.6) require a patch to run under Zen Cart 1.3.8. Take this function and paste it right above the function calculate_deductions() in the file includes/modules/order_total/ot_better_together.php The latest versions (1.6 and greater) include this patch, but if you haven't upgraded, you must manually apply the patch. Q: I'm using a category function - add_prod_to_cat() or add_cat_to_cat() or add_twoforone_cat() - and it's not working! Q: Why does using overlapping categories for my condition and discounted item not work? A: Having overlapping category specifications for the conditions and discounting issues can cause issues. This issue (and some remedies) is discussed on this page. Q: What's the difference between Buy Both Now and the Better Together Promotional Page with Add Both to Cart? A: They're two separate products. Buy Both Now works with the marketing text on the product info page; the Promotional Page with Add Both to Cart works on the Promotional page. A: Installation instructions are here. If you've never installed a Zen Cart mod before, please read my Guide to Mod Installation on Zen Cart. A: Decide on the linkages you wish to use, and add them to the setup() function in includes/modules/order_total/ot_better_together.php ("Linkages" are what "add_prod_to_prod," etc. are called.) Don't want to edit code? Get the Better Together Admin panel. A: This feature is included in the Better Together Admin panel. Alternately, you can write PHP code to do this; please see Timing Discounts in Zen Cart for an explanation of how to do this. Alternately, you may indicate that you have a Better Together discount policy by adding to TEXT_INFORMATION in includes/languages/english/shopping_cart.php, and inform the user that Better Together discounts will be calculated (and visible) at checkout time. Additionally, changing SUB_TITLE_SUB_TOTAL in the same file to something like 'Sub-Total BEFORE Discount' will emphasize the fact that a discount will be added at checkout time. A: Create your custom template if you haven't already done so. Then customize the file includes/templates/template_default/templates/tpl_product_info_display.php Follow the directions in marketing in the installation instructions for details on the changes that are required. Q: I don't want Discount Preview or Checkout Candy, but I'd still like to make a contribution to show my appreciation for Better Together - how do I do this? Q: Can I do three for the price of two? Four for the price of three? A: No - but you may want to look at Discount Chooser, which can do this sort of thing. Also Combination Discounts and Big Chooser would work. Allow people to add your cross sold items (without attributes) with a single tick of a checkbox using Checkbox Cross Sell. Buy Both Now allows you to provide a one-click interface to adding both linked items to the cart on the product info page. Combination Discounts allows you to group more than two items together for discounting. It's Better Together for multi-item sets. Big Spender allows you to provide "Better Together" style discounts based on the amount spent, with configuration in PHP like Better Together. Discount Chooser allows you to provide "Better Together" style discounts but with an admin panel, and more flexibility. Show Better Together discounts on the shopping cart page using Discount Preview. Show Better Together cross selling text on the shopping cart page using Checkout Candy. I charge a fee for each of these extensions. Contact me for details. 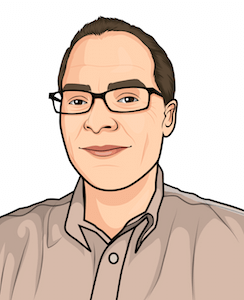 Copyright © 2003-2019 by Zen Cart Expert That Software Guy, Inc. This page last modified 12/21/18. Built with Bootstrap.